Nourishing the next generation with healthy and affordable school lunches won both the hearts and minds of the judges and audience at Rotorua X 2017 Pitch Night last night. Ka Pai Kai Rotorua won both EPIC Pitch and People’s Choice Award. Jasmin Jackson and Pollyanne Taare delivered an impressive pitch to the 100 plus crowd showcasing their social enterprise that sells and delivers school lunches either at cost or at a subsidised rate. Alia Ryan from Boost Fundraising and Events was Runner Up with launching Melt: Festival of Chocolate to be held in Rotorua over Easter weekend next year. Both organisations took a share of the $13,000 prize pool of business support services, mentoring and training. Ka Pai Kai’s passionate pitch highlighted that many children are “being overfed and undernourished”. Through funding, grants and sponsorship Ka Pai Kai are making nutritious food that the kids love, cooked fresh every day and delivered to the schools. They are currently servicing with five primary schools in Rotorua and have ambitious plans to grow. This was the event’s fourth year and provides an opportunity for local commercial and not-for-profit organisations to practice their pitch and showcase what they are doing to the business community. The esteemed judging panel included Mayor Steve Chadwick, Michelle Templer chief executive of Rotorua Economic Development Limited, Mark Copeland principal of commercial lawyer firm Mark Copeland Lawyers, Daryll Church principal of DCA Architects and Graham Gaylard chair of Soda Inc.
Head judge Steve Chadwick said she absolutely loved the night and love was the word to describe the evening. She acknowledged the audience, all the pitches and Rotorua X. Announcing the overall winner, she spoke on behalf of all the judges and said Ka Pai Kai’s presentation blew them away. “It was a very compelling presentation, beautifully presented from the heart and your experience shone through,” she said. Jasmine Jackson and Pollyanne Taare were very humbled to walk away as the EPIC Pitch Winner and the People’s Choice Award. Alia Ryan from Boost Fundraising and Events was runner-up pitching her chocolate festival. Melt is set to be an annual event held over the Easter weekend in Rotorua and plans to be four days of chocolate powered indulgence. She says Pitch Night gave her a deadline to launch the fundamental layout of Melt, Festival of Chocolate. “Being named EPIC Pitch Runner Up, is pretty cool. It’s not so much about the award itself or the prizes, those are great too, but it means that people are genuinely excited about this new event and that means we are on to a good thing,” she said. All pitches from the evening can be viewed on the Rotorua X Facebook page. Rotorua X is a charitable trust with the purpose to connect and inspire Rotorua businesses and social enterprises. 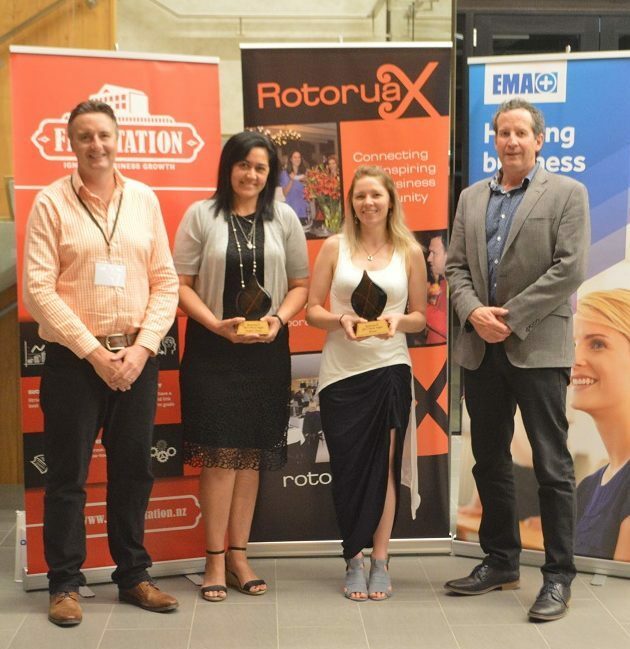 The evening was only possible through the sponsors Employers and Manufacturing Association Bay of Plenty, Toi Ohomai Institute of Technology and all the organisations that provided goods and services as prizes. Jasmin Jackson and Pollyanne Taare from Ka Pai Kai Rotorua.